James Phelps was promoted to serve as the next director of Breckenridge Public Works on Wednesday, according to a town news release. He takes over the job after starting at the same department as a seasonal worker 30 years ago. Rising through the ranks over the last 30 years, James Phelps became the new director of Breckenridge Public Works on Wednesday. He takes over the department after Tom Daugherty left to lead the public works department in Silverthorne. Before that, Terry Perkins served in the position from 1983 until he retired in 2012. Phelps’ compensation was not available by presstime Friday. However, the position is scheduled to pay somewhere in the range of $100,700 to $151,100 annually, according to the town’s 2017 budget. 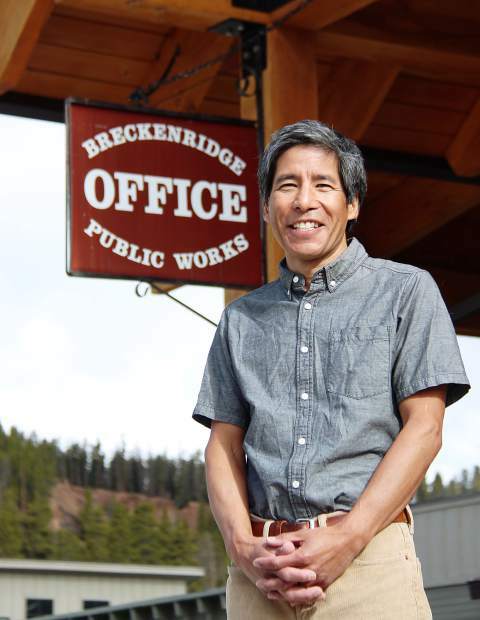 In a Thursday afternoon statement announcing Phelps’ promotion, Breckenridge town manager Rick Holman praised the department and its new director’s longtime service. In fact, Phelps is taking over the fastest growing department in the town. Overall, it’s tasked with maintaining the town’s infrastructure, while educating the public on available services, as well as supporting a wide variety of special projects and events. To do all this, the department has a $6.7 million budget and 80 full-time and 20 seasonal employees spread across seven divisions — including administration, engineering, facilities, fleet maintenance, the Free Ride transit system, streets and parks, and water. Construction of a new, second water plant is in final design stages. One of those divisions, the Breckenridge Free Ride transit system, has experienced significant growth since its creation almost 20 years ago, and it is expected to ferry 1 million riders to their destinations this year after recording its 10 millionth rider in January, said Breckenridge director of communications Kim Dykstra. Like Holman, Dykstra too praised Phelps’ longtime service and his commitment to the city. Talking about the hiring process, she said the town brought in an independent firm to assess the department, its structure, and the feasibility of hiring from within. With that assessment, town officials felt confident they had the right man for the job in Phelps, and as a result, did not post the position or launch any kind of wide-reaching search for its new director, Dykstra said. Dykstra explained the town often tries to hire from within its own ranks when openings arise. The release announcing Phelps’ promotion also details his history with the department. He was first employed seasonally for the parks division from 1987-96. He began his full-time career as a streets operator, and he was promoted in 1998 to streets superintendent, a position that shifted into the streets and parks manager in 2003. In December 2005, a reporter with the Summit Daily caught up with the “wiry and energetic” parks manager as he was preparing to clear near-record levels of snowfall in a plow. At the time, the crew had 53 miles of roads in the town and about another 17 miles of sidewalks to clear. An avid Nordic skier and biker himself, Phelps noticed locals out and about throughout the interview. The following year, Phelps became the department’s assistant director, and for the past four months, he has served as the interim director. A Colorado native, Phelps graduated from Estes Park High School before attending the University of Colorado, where he obtained a degree in environmental biology. After traveling South America in the mid-1990s, he returned to Breckenridge full time to pursue his career with the town — and this is when he met his wife, Amy.